MICHAEL CHEIKA WAS happy to see Australia “tough it out” in their 23-18 win over South Africa – and revealed a late reshuffle for Saturday’s clash left him needing to issue an apology. Adam Coleman had been due to start for the Wallabies in the Rugby Championship fixture at Suncorp Stadium, only to pull out just hours before kick-off for family reasons. The second-rower returned home to be with his pregnant wife, forcing Cheika to promote Izack Rodda from the bench and summon Rob Simmons back from club duty. Simmons had left the squad to play in the National Rugby Championship (NRC) in Sydney at the behest of the Wallabies boss, only to then fly back to join the squad in Brisbane in time for the game. Israel Folau also dropped out of the squad at late notice due to an ankle injury, yet Australia went on to triumph 23-18 and open their account in this year’s competition. “Adam’s wife’s heavily pregnant so it looked like things were happening, so he needed to go back home, family first,” Cheika said. “We all know that, that’s what we’re like in our team here. There was no question of getting back there to be with her tonight. “The other boys filled in pretty quickly. Simmo [Simmons], who we sent back to Sydney to play NRC, I feel so guilty because I forced the Sydney guys to make him play and then I rang the coach Chris Whitaker at 12:30 or 1 o’clock and said, ‘mate, I need this bloke back on a plane’. The result eases the pressure on Cheika following back-to-back defeats against Bledisloe Cup rivals New Zealand. South Africa led 18-17 at the break but a pair of second-half penalties from Matt Toomua secured a much-needed result for the former Waratahs boss. 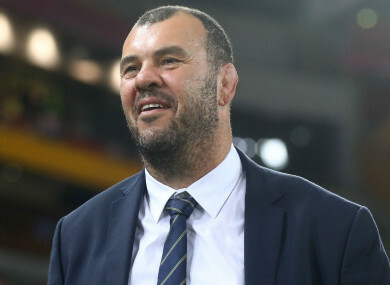 “When people stick it to us, it’s only because they want us to do better,” Cheika told Fox Sports. “I’m sticking it to myself most of the time when it doesn’t go right. Email “Cheika: 'I rang the coach and said, "mate, I need this bloke back on a plane"'”. Feedback on “Cheika: 'I rang the coach and said, "mate, I need this bloke back on a plane"'”.